The 109th Canton Fair (Phase III) held on May 1- 5, 2011, in Guangzhou Pazhou International Exhibition Centre. Many Foreign Trade Department sales elite of Hubei Bluelight Science & Technology Development Co., Ltd. have participated in the exhibition. China Import and Export Fair, also known as Canton Fair, founded in the spring of 1957, held in Guangzhou every Spring and Autumn, so far, it has more than fifty years of history. Over the years, the Canton Fair has been the world economic community and meeting place for foreigners, demonstratef fully capabilities and talents of the window of China, and it is the essential technology information exchange and trade crossroads. The Fair is the largest trade fair in China. Among China's largest trade fairs, it has the largest assortment of products, the largest attendance, and the largest number of business deals made at the fair. Like many trade fairs it has several traditions and functions as a comprehensive event of international importance. 109th Canton Fair Phase III opened on May 1. Slightly different with the last show, in this year's trade show 533 participating health insurance companies, medical device 56% share of exhibitors, including medical devices class enterprise shine, exhibitors and imported games on the same hall, a high-profile acting Attracted the attention of a large number of foreign buyers. This year is the "second Five Year Plan " the first year, but also further promote the development of foreign trade in transition year, the 109th Canton Fair to "promote the transaction optimization services, to develop a new pattern of foreign trade"as the central task. In the Canton fair 533 exhibitors of health-care exhibition, The proportion of medical devices exhibitors reach 56% , Of which Medical appliances class enterprise shine brilliantly, exhibitors and imported games on the same hall, behaving loftily., attracting a large number of foreign buyers.
" is as the central task of the 109th Canton Fair. Only May 1 to May 4, there are 207,103 buyers from 209 countries and regions, Increased 3.93% to the 108th, Increased 1.52% to the 107th . Of which Oceania buyers will increase 11.96% over the previous, American Growth 9.76%,8.75% growth in Asia, Africa decreased 2.46%, 11.74% reduction in Europe. The current export turnover of 36.86 billion U.S. dollars, up 5.8% over the previous, up 7.5% over the last two . Generally reflected the number of business customers received an increase over the previous. As the impact of the earthquake in Japan, the Japanese customers down 9.96% over the previous; in the Middle East under the impact of instability, the customers down 1.53% over the previous. The ASEAN, BRIC countries (Brazil, Russia, India, South Africa) to be increased more customers, both up 21.4%. During the fair, there was diversified medical device products. In addition to medical dressings, syringes, protective clothing and other low-value supplies and electronic blood pressure monitors, glucose meters, medical beds, wheelchairs and other electronic products continue to cure in the end appeared outside the exhibition hall, C-arm X-ray machine, anesthesia machine, ultrasound, in vitro Counterpulsation device and monitor medical equipment such as high-end products are also testing in the Fair.
" Countries to medical equipment import certification requirements have strict registration, Companies need to submit a series of foreign regulatory authorities for registration or certification materials before export, so during the trade fair, with buyers to negotiate is the main intention, the real order signing need the two sides further consultations After the Fair. ". Ni rulin , points out that, in recent years, due to rapid growth of China's exports of medical equipment, the number of firms is also growing year by year, At present our country medical appliances enterprises with remarkable achievements transformation and upgrade, Foreign export commodities is continuously improved added value, Even is actively create independent brand strategy, showing that China's pharmaceutical foreign trade restructuring, transfer mode has been noticed. China Import and Export Fair is currently the largest international event, Hubei Bluelight leadership of the company attaches great importance to the exhibition, and made ​​careful preparation and planning stage. This time displayed a dozen products independently developed byHubei Bluelight , type and style as much as the most rated peers, in which all products are exclusive patent protection for domestic products. During the exhibition, attracting a large number of visitors from countries and regions around the world, Product design and physical therapy got their recognition and praise. Before the exhibition crowds, who packed the stand to experience a large number of visitors have contact to discuss. 5 short days in the Canton Fair, the company has signed number of sales order. Business cards collected from more than 500 customers. Walking in the health care pavilion, shuttling between friends from different countries, seems to cause your body to a tribal global village, an array of all kinds of novel and unique health care products, came into view, you will be a number of distinctive design, ingenuity and And practical convenience, all reflect the concern for human health, impressed by the health care products, you can not help but lament heartily, scientific and technological progress, an era of globalization to bring the health of our priceless treasure! breakdown of the booth, the booth plain blue Minimalist, but the very vitality and beauty, such as an elegant focal bloom in the sun. Soon as cordial greetings, a beautiful smile, a friendly handshake, a style and soul whispered dialogue will give a good impression on each other! submit a business card in the moment, knowing that the world's most beautiful --- name of the language of the moment the two sides will leave unforgettable memories with each other! Each friend each stop in the Bluelight booth, will feel that our friends from home and abroad to create a very warm Atmosphere, that trip to China will bring you a different journey, fruitful, rewarding experience! Hubei Bluelight neuromuscular electrical stimulation to enhance the power of the new method is a pain relief and treatment of many diseases stimulator. Only one device can be a wide range of treatment options, designing exquisite simplicity, reliability in focus also reflects the user's considerate. Just press the "ON" button to start treatment. Stimulate the user can set their own strength. Users are not in use is limited to being pre-programmed stimulation; all programs can be set independently; electrical stimulation therapy has no side effects, does not cause discomfort. Electrical stimulation can improve the quality of life of users, because both the decompression, relax, re-training, enhanced physique, beauty or fitness, treatment of disease are the best choice. 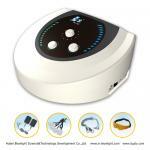 Hubei Bluelight neuromuscular electrical stimulation stylish compact design, easy to carry, can be used for home or clinical treatment. Effective re-training and rehabilitation - re-training of muscle electrical stimulation is a simple treatment, Hubei bluelight neuromuscular electrical stimulation may be professionals and home users to provide an effective training opportunities to carry out the muscles, can Weak or spastic muscle strength training routine again, but also in some special cases, such as sports injuries and the need to enhance muscle strength and flexibility as muscle re-training when the great add. Two channels of muscle stimulation can be synchronized to produce continuous motion. For example: the same treatment of femoral muscle and perineal muscles possible. Cycle stimulation and endorphins - the body given to relieve pain stimulation device called transcutaneous electrical nerve stimulation (TENS). TENS is an electrical pulse, which can effectively act on the nervous system, by interfering with the transmission of pain signals to the brain, relative to the body and pain, "confusion ", which played local pain, real pain and chronic pain relief. 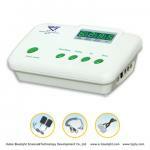 TENS electrical nerve stimulation induced release contains a set of periodic high-frequency pulses. 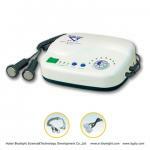 This will not only ease the local pain and pain, and relieve the body of chronic pain. TENS way the nervous system can release endorphins, which alleviate the pain of a body's own material. Bluelight neuromuscular electrical stimulation meridian points of traditional Chinese medicine with the motherland are the classic principles of medical treatment, fusion electrotherapy, magnetic therapy, massage, massage, acupuncture, qigong, water, hand, foot and reflection of electromagnetic therapy, therapeutic and other active magnetic water treatment, can be Provide a variety of accurate pain relief and disease treatment. 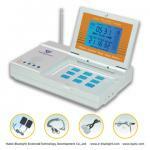 Hubei Bluelight neuromuscular electrical stimulation of the advantages: equipment reliability, excellent safety, the treatment completely, directly to the root cause, the chain features a simple user-friendly interface, efficient and comfortable stimulation, the treatment process, a light control function instructions LCD liquid crystal display, real language tips and more. The exhibition was successfully ended in May 5, contains all brilliant triumphant return. The show not only improved the company's brand awareness in the country, as well as product out of China, into the international market and laid a solid foundation. Through face-to-face communication with customer, understand customer's needs and opinions, but also promoted the commendable friendship with customers. to understand customer needs and insights, but also Enhanced customer valuable friendship! for the trade between China and the rest of the world, the Canton Fair played a very good bridge! “The origin of life is just a seed, the value of health is inexhaustible energy ”,health a suit, bright beautiful life! Health is the primary wealth for humans! Every life is a miracle, we value the health of human beings, and We have the most simple and the most warm wishes to all of your friends, I wish you healthy and happy, and prosperous! We are grateful to the new and old customers and all friends from home and abroad who have always support Bluelight, Bluelight will always be your most loyal friend, Bluelight will always be an angel to protect your healthy! Warm Congratulations to the complete success of exhibition!